Unless indicated otherwise by Chess & Games Shop, prices are indicated in Euros and are deemed to be exclusive of import taxes, delivery costs and postage. Should Chess & Games Shop accept a Purchase Order and issue an Order Confirmation, then a sale agreement (the "Agreement") shall be entered into by and between Chess & Games Shop and you whereby Chess & Games Shop shall sell, and you shall buy, the Products set forth in the Order Confirmation. The Agreement shall be composed of, and governed by the terms and conditions set forth in, the following documents, ordered by decreasing importance, i.e. (1 step) these GTC, (2 step) the Order Confirmation and (3 step) the Purchase Order. In case of discrepancies between the provisions contained in those documents of different ranks, the provisions of the higher rank document shall prevail. Purchase Order can be paid by Pay-Pal or by any other method of payment available on the Online Shop, at your own choice. By placing a Purchase Order, you guarantee Chess & Games Shop that you have the authorizations required to use the chosen method of payment. Chess & Games Shop reserves the right to suspend any order procedure or any delivery if authorization of payment is denied by any certified financial institution or in case of non-payment of the Purchase Order. Chess & Games Shop specifically reserves the right to refuse to carry out a delivery or to honour a Purchase Order coming from a customer who has not fully paid an order or with whom a dispute is underway. The ordered Products will be delivered at the delivery address indicated in the Order Confirmation. You must therefore verify that such address is correct and inform Chess & Games Shop stuff of any error or change without delay by e-mail. You will assume all responsibility and shall bear all expenses incurred arising out of, or in connection with, the indication of an incomplete or incorrect address. 2. Delivery is via third party courier. 3. All deliveries are sent with registered couriers and must be signed for at time of delivery. 4. Shipping address cannot be changed once order(s) has been shipped. 5. As the registered couriers are third-party courier companies, we are unable to control their delivery time. The courier is also unable to ring you prior or during delivery. 6. If the delivery is to your home address, it is best to ensure someone is home to receive the goods. If not, we recommend using an alternative, like your work address for delivery. 7. If you are not home at the time of delivery additional delivery charges may apply. 8. Order cannot be cancelled once order has been shipped. 9. Shipping time may vary depending on your location, please allow 2 – 10 days for delivery. 12. For EU residents and companies - if delivery weight is less than 1 kg, you can choose whether you want to track it or not. In case you decide to purchase without tracking, we can't 100% guarantee you will receive it. 13. Non-EU residents - all shipping charges are calculated for economy postage, if you prefer air please send us an e-mail. If you ordered a Product which is no longer available or which will not be available (in ChessGamesShop.com's warehouse) within at least 2 weeks after the date of the Order Confirmation, ChessGamesShop.com will inform you of such shortage by e-mail as soon as possible and you shall be entitled to cancel the Purchase Order concerned. If you do so, you will be entitled either to request a refund or order a replacement Product. If you are unsatisfied with your order of Products, you may cancel your order at any time within thirty (30) days, beginning on the day after you received the Products. In this case, you will receive a full refund of the price paid for the Products in accordance with article 13 below. To cancel an order of Products, you must inform Chess & Games Shop in writing. You must also return the Products to Chess & Games Shop immediately in their original condition and packaging to the following address: « Chess & Games Shop, Spikova 13, 4000 Kranj, Slovenia , and at your own cost and risk. You have a legal obligation to take personal care of the Products while they are in your possession. Chess & Games Shop will not be responsible or liable if any Product you wish to return is delivered late or lost. 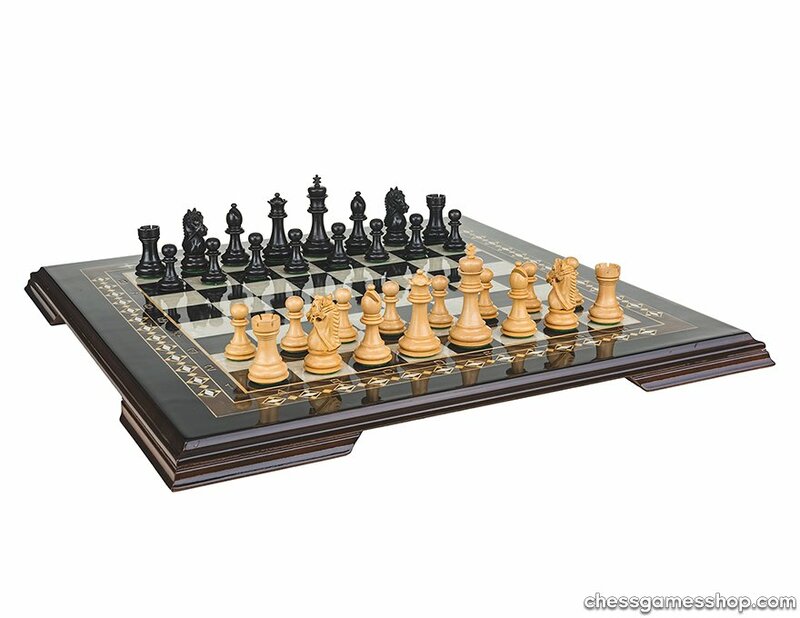 In addition, Chess & Games Shop has sole discretion in determining whether the Products are in original condition when returned to Chess & Games Shop. If you order Products from the Site, they may be subject to import duties and taxes which are levied when the delivery reaches the specified destination. You will be sole responsible for payment of any such import duties and taxes. Please note that Chess & Games Shop has no control over these charges and cannot predict their amount. Please contact your local customs office for further information before placing your order. Please also note that you must comply with all applicable laws and regulations of the country for which the products are destined. Chess & Games Shop will not be liable for any breach by you of any such laws. Chess & Games Shop undertakes to comply with all applicable legal standards when gathering, processing and using your personal data. Thank you for trusting ChessGamesShop.com - we appreciate your business.